Lead your assembly in song with complete musical settings of responsorial psalms and Gospel Acclamations in Spanish. This five-CD set includes recordings of every psalm setting and Gospel Acclamation in Responde y Aclama 2019 for all the Sundays and holy days of the 2019 liturgical year (Year C). Helps cantors, choirs, organists and instrumentalists develop an ear for the repertoire — before singing or playing a note. Features beautiful recordings with professional musicians. The Responde y Aclama 2019 keyboard/guitar songbook features easy-to-read, large-size music notes, chords and text. This is the five-hole punched version of the Responde y Aclama 2019 keyboard/guitar songbook, containing complete musical settings of responsorial psalms and Gospel Acclamations in Spanish for the 2019 liturgical year (Year C). Enjoy having all of the responsorial psalms and Gospel Acclamations from Responde y Aclama 2019 (Year C) in the convenience of an eBook! *This mobile eBook is not intended for use on desktop/laptop computers or for printing/copying. Please note: the USCCB does not currently approve tablet devices for liturgical use at the ambo or pulpit. 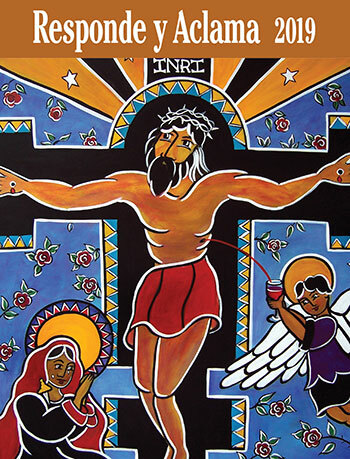 This best-selling Spanish-language resource provides complete musical settings of responsorial psalms and Gospel Acclamations for every Sunday and holy day of the 2019 liturgical year (Year C). All psalms and acclamations correspond to the text of the Leccionario de la Misa, and all match the responses found in Unidos en Cristo/United in Christ, Misal del Día and Today's Missal with Spanish Insert. Features include simple but beautiful arrangements for choir, cantor, organ and guitar, along with verbatim texts from the Leccionario de la Misa. The horizontal rules between verses in the songbooks help singers keep their place and the easy-to-read, large-size music notes, chords and text add to its user-friendliness. Give your musicians the tools they need to learn and play music at Mass with the available 5 CD set, featuring recordings of every psalm setting and Gospel Acclamation. Compare Responde y Aclama with other psalm resources here. *Not intended for desktop/laptop or for printing/copying; slightly modified from original print version. Please note: the USCCB does not currently approve tablet devices for liturgical use at the ambo or pulpit.